By John ~ September 4th, 2009. 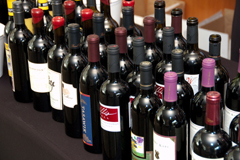 Looking for a great deal on a Washington State wine? September is the month to find them this year. Normally, August is Washington Wine Month, but weâ€™re dealing with a government monopoly here, so until the Washington State Liquor Control Board got their act together on their software, it had to be temporarily postponed. Finally, the list of what deals are available at Washington State Liquor Stores during September has been released. Many independent wine retailers will offer their own specials as well. Who says Washington wines are overpriced? Looking through the list, I counted over 150 wines selling for less than $10 a bottle and more than a dozen less than $5. And these are not jug wines, folks; there are wines from respected producers like Columbia Crest, Chateau Ste. Michelle, Barnard Griffin, Hogue, Columbia, Sagelands, Snoqualmie, Waterbrook, Domaine Ste. Michelle, and many more. As you know if you are a regular Wine Peeps reader, quality is not connected to any particular price point. There are excellent $7 bottles and terrible $77 bottles, and vice versa. What we look for are wines that have a great price compared to wines of similar quality within the same varietal/type, i.e. a good QPR (quality-to-price ratio).